A new study, led by Swansea University, reveals that the density of barriers in European rivers is much higher than indicated by available databases – up to one barrier in every kilometre of river. Information about the location and density of smaller barriers is often unknown, but these smaller barriers present the biggest problem for the health of Europe's streams and rivers. Now, for the first time, scientists are inviting citizens to help in updating information about these barriers with a newly-developed smartphone app. Scattered across the rivers of Europe are hundreds of thousands of man-made barriers, many of which are completely obsolete. Today, these barriers can provide energy, water, fishing and leisure opportunities, and might even prevent the spread of invasive river species. However, they also present considerable obstacles to sustainable river management. Aside from presenting a potential flood hazard and subsequent costs to both the economy and the lives of local residents, barriers substantially change river ecosystems and block the natural swimways of migrating fish. Eel, salmon and many other species all rely on complete connectivity between the sea and their upstream river habitats to complete their life cycle. A European initiative of scientists, hydropower and non-profit organisations called AMBER, led by Swansea University is exploring new solutions for river connectivity. Scientists working for the project collected all available data on river barriers from across Europe, and then validated these data by going out into the field to survey a total of 1,000km of actual river. The researchers found that the number of barriers recorded in existing databases only amounted to 3% of the total number of river barriers in Europe. Based on their first observations, they estimated an average of one barrier per kilometre of river. Clearly, the picture of river fragmentation in Europe is woefully incomplete. 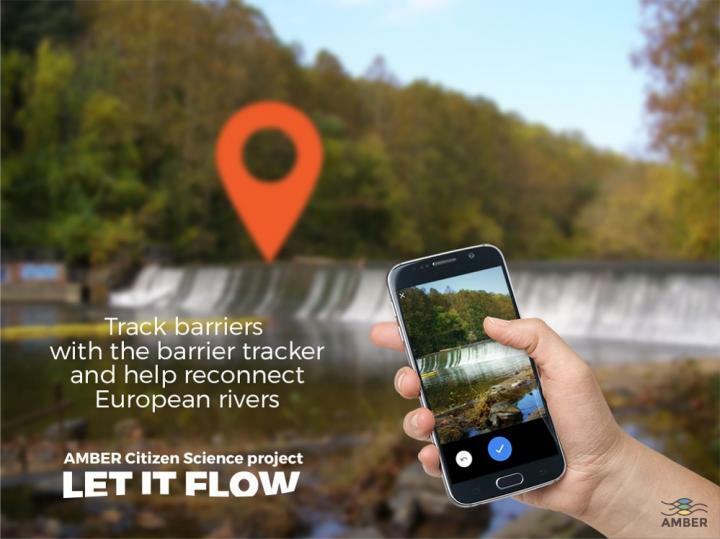 Now, for the first time, citizens are being asked to help improving connectivity of European rivers by using a smartphone app called Barrier Tracker (freely available from Google Play or App Store). With the app they can document or update the status of barriers that they come across along their local rivers. Information can also be uploaded to a website. One of the major reasons for the discrepancy between existing data and the data that AMBER collected from real rivers is that current databases mainly document barriers that are higher than 10m. In the field, the researchers found that many river barriers were much smaller than this. Importantly, research suggests that these smaller barriers present a far greater problem for river connectivity – especially since they occur at such high density. Recruiting citizens to help document small river barriers is a crucial step in maintaining healthy river systems across the continent. The launch of the Barrier Tracker app will take place on 21st April 2018. The launch also coincides with World Fish Migration Day, a one day global-local event to create awareness on the importance of open rivers and migratory fish. In Wales the event "A Trout's Journey" is organised by Swansea University, Southampton University have organised some interactive activities for all the family, in Scotland a screening of the film DamNation has been organised by the University of Highlands and Islands. In the UK many dams, weirs and other obstacles have been recorded in institutional databases and the map is nearly complete, but field surveys have revealed that many barriers are missing from these databases. Therefore, the project asks citizens to help validate these databases, to see if what they have is correct or if they have missed barriers in their area. * The study is part of the EU-funded "H2020 AMBER project". AMBER, coordinated by Swansea University and seeks to raise awareness of the problems posed by stream fragmentation, the pressures on freshwater ecosystems, and the need for innovative solutions to restore river connectivity. The project is working with hydroelectric companies, water providers, NGOs, anglers and local authorities to restore river connectivity in a way that maximizes the benefits of water abstraction but reduces environmental impacts. When reporting this story, please use Swansea University hyperlinks. In 2017, Swansea University became the top university in Wales in The Times and The Sunday Times Good University Guide league table, and also won the inaugural Welsh University of the Year title. It is also ranked within the top 300 best universities in the world in the Times Higher Education World University rankings 2018. The University has been awarded a Silver rating in the inaugural Teaching Excellence Framework in 2017. In the assessment the University was commended for the high proportions of students from all backgrounds achieving excellent outcomes such as progressing on to professional level employment or further study.